Gymnaestrada is a unique form of participation in gymnastics inclusive of all ages or skill levels. It is an element of Gymnastics for All that is a performance based non-competitive activity involving a combination of dance, acrobatics, and gymnastics, with or without apparatus. Gymnaestrada’s focus is on mass participation in gymnastics and the goals are to promote and encourage joy in exercise and to demonstrate the development of the participants. Provincial Gymnaestrada events are held annually and Western, National and World Gymnaestrada’s are held in a 4-year cycle. The World Gymnaestrada is the International Gymnastics Federation’s largest event with over 21,000 participants worldwide and takes place every four years typically in Europe. Our World’s Team will be heading to Austria in July of 2019 to attend World Gymnaestrada! This year we will have both Provincial Team, as well as a World’s Team. NOTE: As the team does rely on full group participation, practices are mandatory. There is a participation contract included in the registration form that all team members must sign prior to participating. The World’s team will be travelling to the World Gymnaestrada event in Dornbirn, Austria, July 2019!!! NOTE: that the training cost does not include the Trip to Austria, this will be additional. NOTE: As the team does rely on full group participation, practices are mandatory. There is a participation contract included in the registration form that all World’s team members must sign prior to participating. Sign up at our FlipGive and shop at one of the applicable places and 10% of what you spend will go to help fund our World Gymnaestrada Team! But I have no gymnastics or dance experience! It doesn’t matter. If you’re willing to commit to practices and learn in a fun, welcoming environment, you can be on our Gymnaestrada team. Our performances combine complex moves by some of our more advanced gymnasts, with simple moves from beginners. Everyone performs at their own level, but it all comes together into a cohesive performance that has made us one of the most entertaining teams to watch in the province! Who is this program for? 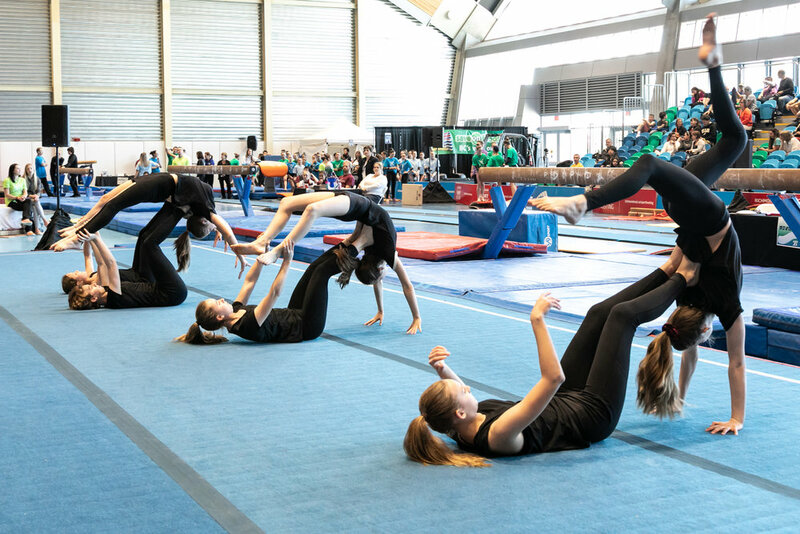 Anyone 7 or older, who loves to perform, can commit to regular team practices, and who wants to learn and practice basic gymnastic, tumbling and dance skills in a highly social and supportive environment. You must be able to travel with the team to performance destinations. When do I register? The program runs from September to May/June, although exact start dates vary from year to year. Some years, performances may occur in the summer. Please contact the Program Coordinator prior to September for registration information. How do I register? Please call our office at 604-943-0460 or send an email to registration@deltagymnastics.com. Program coordinator emails can be found on the Our Staff page. To complete your registration, you must complete this Google Doc(Provincial or World) and fill out the correct registration form and turn it into the office, either in person or scanned and emailed. Watch our Junior Gymnaestrada Team perform at BC Gymnaestrada 2017!